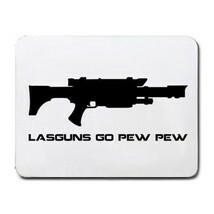 Warhammer 40k Lasgun Mousepad This is a "Lasgun go pew pew" mousepad. It is made from durable heat-resistant polyester fabric top and will help your mouse pointer move across the screen more smoothly and accurately. The back is made with non-slip neoprene rubber keeping it from sliding regardless of surface material. The mouse pad is machine washable and doesn’t discolor fade. Dimension of the mousepad is 9” x 7” inches and 1/8” inch thick. If you have any questions, feel free to shot me a message. Thanks for looking. Shipping Time We ship out products 3 times a week. Once items is shipped it usually takes 8-15 business days for it to arrive. This means that it majority of the time it can take up to 17 business days for items to arrive on your doorsteps if you placed your order on the weekends. Please understand and make sure you are ok with this before you place an order. 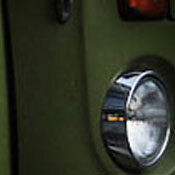 We value our feedback ratings greatly and do not want there to be any misunderstanding. Thanks for your understanding!